When a family is visited by a gigantic Black Dog only the youngest in the family has the courage to go out and play with him. As the story progresses the dog slowly shrinks giving children a very clever sense of how fear shapes our perceptions of the world. 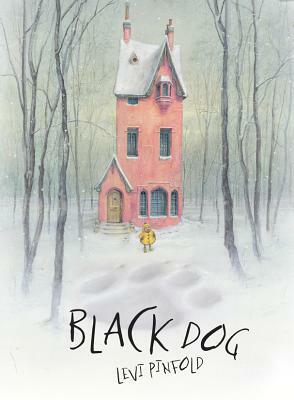 Filled with spectacular illustrations with multiple storylines running in smaller panels throughout, Black Dog is sure to delight and engage young readers and listeners. Levi Pinfold’s first book, The Django, was long-listed for the Kate Greenaway Medal in the U.K. A wanderer at heart, Levi Pinfold lives in Brisbane, Australia. Pinfold’s story has a timeless quality despite its entirely original flair, with sumptuous paintings and thumbnail embellishments adding narrative and descriptive content... A great pick for storytime, bedtime, anytime. An ode to scale, to the portholes and bay windows of Victorian architecture, the poetry of family chatter, and steampunk elegance of antique hot-water heaters, all are here for young eyes to luxuriate in and imagine that they are courageous Small with their family’s love shining down like rainbows. Fear, fun, and just dripping with beauty, this title will pair perfectly with Neil Gaiman’s The Wolves in the Walls. Pinfold’s lavish, Van Allsburg-like illustrations, which juxtapose tiny black-and-white sketches with big, detailed, frozen-in-time paintings, are quirky, funny, and often heart- stopping. Part David and Goliath, part Gingerbread Man, this UK import is a shot of courage for those who need it most. Pinfold’s interiors are crammed with quirky detail, and his small sepia vignettes, which cluster around the story’s text, are an elegant detail. More crucially, the story stays focused, the pacing is strong, and Small Hope is as charming as she is brave. The traditional feel of the cumulative telling and the art’s surreal precision and fanciful decay combine to offer a curious metaphorical consideration of what it means to be afraid and what it takes to conquer those fears. Although a charming story on its own, the rich illustrations add more detail and make the story come alive. Readers will enjoy the message that you don’t have to be big to be courageous. The Australian author-illustrator Levi Pinfold alternates full-page, full-color paintings with smaller, sepia-toned panels. These last recall those of Chris Van Allsburg but have a style all their own. Children and adults will relish the details of Pinfold’s very fine paintings, set in a magical never-time of old typewriters and wood-burning stoves and hand-painted furniture, in which people wear assorted kitchen equipment as hats on their heads. This book evokes one of those classical renderings of THE NIGHT BEFORE CHRISTMAS- so cozy are the interiors. With a clever story and lovely, expressive illustrations, Levi Pinfold explores the idea that fear can often lead us to do think and do foolish things.